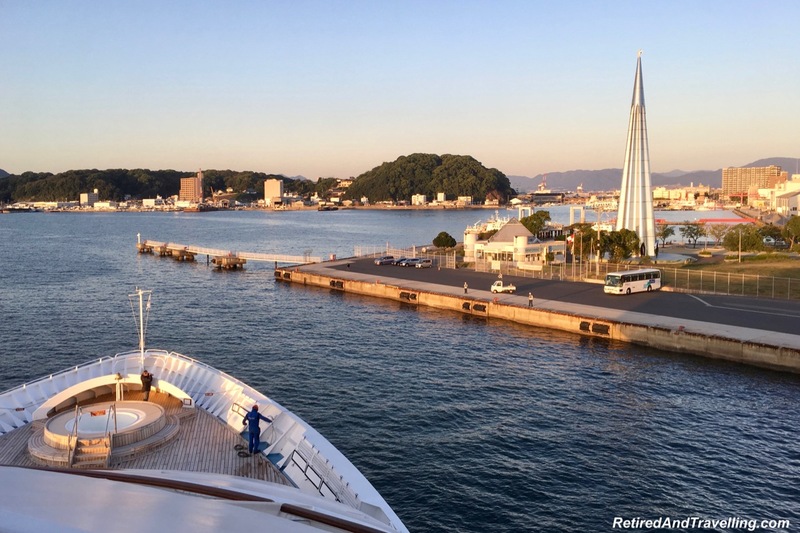 After we docked in Hiroshima, David and I went off in different directions. David visited the Hiroshima A-bomb memorial and museum. 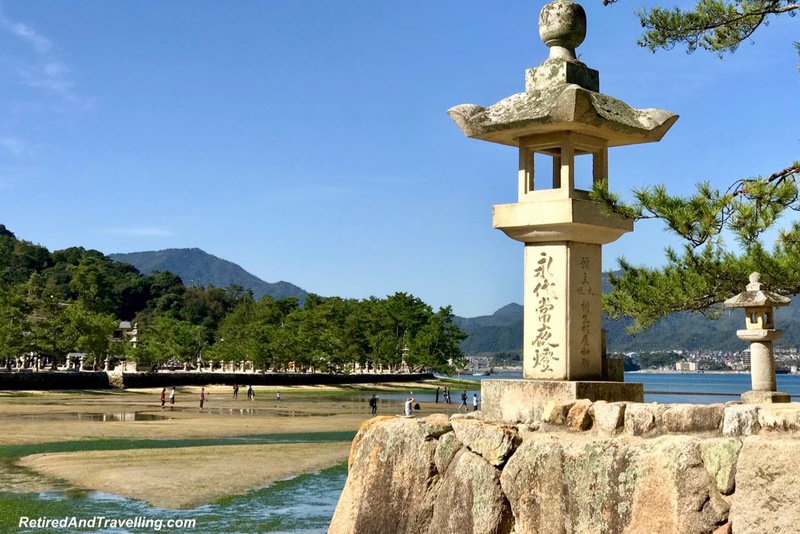 I was so glad I chose to visit Miyajima Island when in Hiroshima. But 2 hours on the island was definintely not enough time! Together we got to see both beauty and history in Hiroshima. And both left an indelible image on us! The ship was docked beside the Tower of Paradise. This shiny landmark shone bright during the day. When we pulled out at sunset, it glowed. It was about a 45 minute ride through the city to get to the ferry dock. 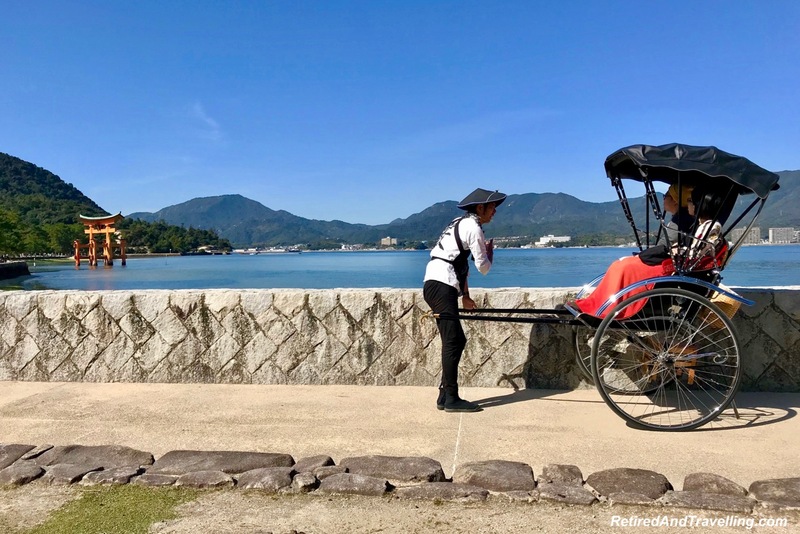 On our ride to the ferry dock, our guide talked a little about the city of Hiroshima. Today it is the 10th largest city in Japan. On all of our stops in Japan, we found castles. So it was not surprising when the guide pointed out the Hiroshima Castle with the now-familiar tiered watchtower. It could have been the Edo Castle in Tokyo or the Nijo-Jo Castle in Kyoto. 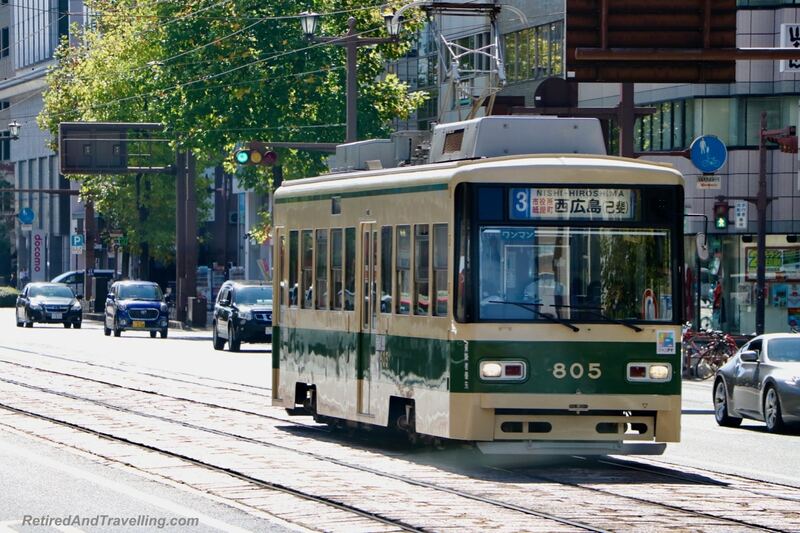 Hiroshima is called the “museum of streetcars”. There were streetcars everywhere. While we did see some new streetcars, old streetcars were often brought in from other cities. We were told that streetcars started to run again 3 days after the WWII bombing. They were offered free of charge. And have become a symbol for this city of the resilience of the people. 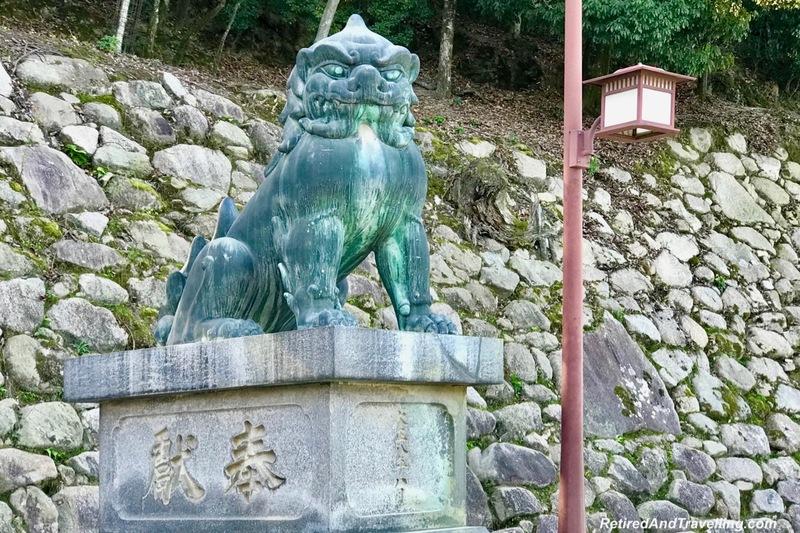 On the trip to visit Miyajima Island when in Hiroshima, I learned a little more about this city. Once we got to the ferry dock, it was not a long wait for the next ferry. This was the short ferry (about 15 minutes). But there was a longer ferry ride from the port close to where our cruise ship docked. At this spot, two ferries ran continuously across the harbour. We boarded and went to upper level on the right side for the best view. The first thing we saw was the oyster beds. 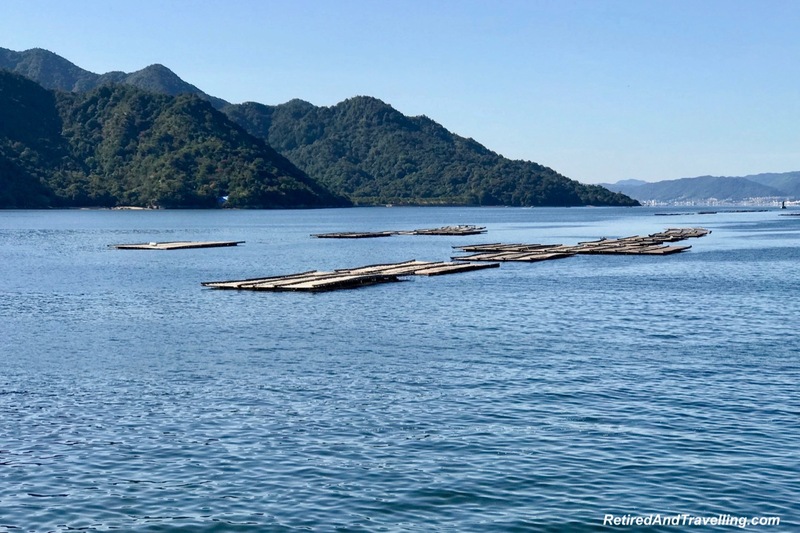 This part of Japan is known for oyster farming. The brackish water is created from a mixing of the mountain runoff water and the sea water. This was the perfect spot for oysters. We learned that they were cultivated on a scallop shell. 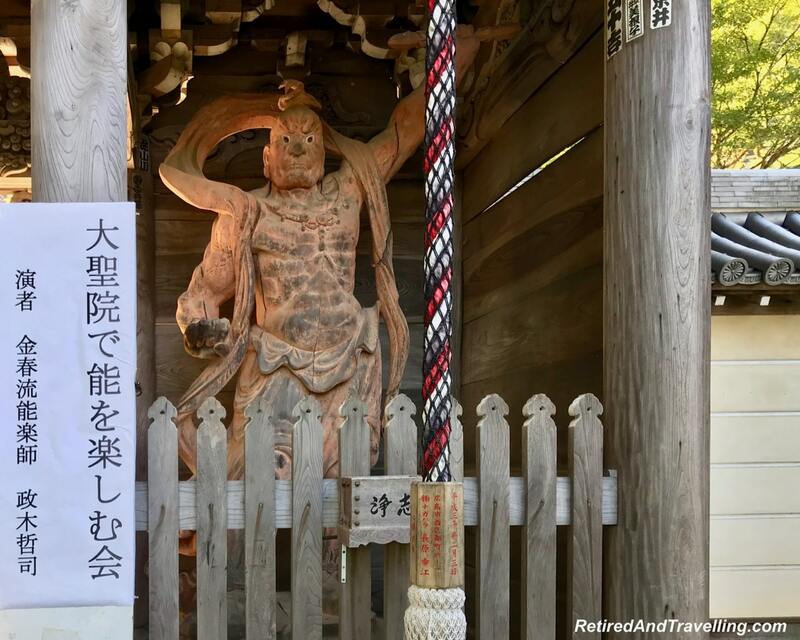 Miyajima Island was considered to be a god and has been worshipped as a divine island. If you looked closely, the spine of the island sorta looked like a face. 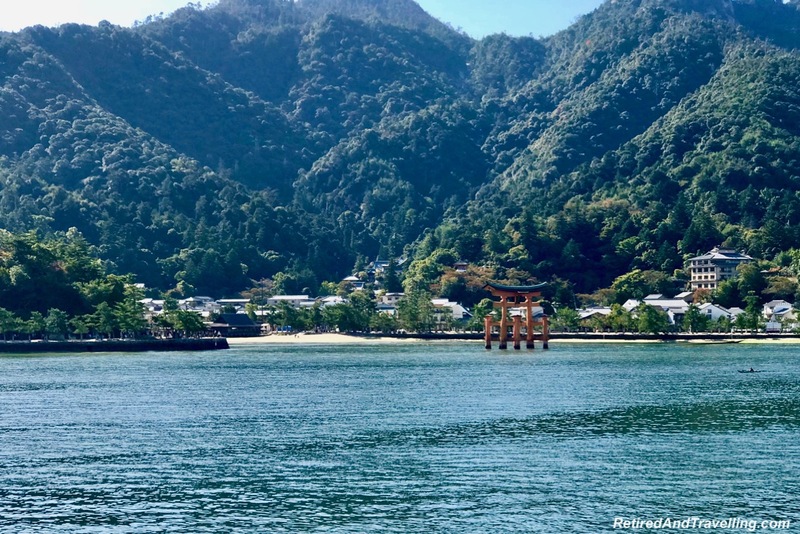 The Itsukushima Shrine was built as the place of worship where the tide ebbs and flows. Originally no people were allowed to live on the island. But today people can live there. But no industry is allowed. As we neared the island, we got our first view of the O-torii Gate. This is the iconic image for this island. The best time to see the gate in the water is at high tide. At that time is seems to just be floating on the water. If you visit during a full moon, the high tide is actually 4 metres higher. 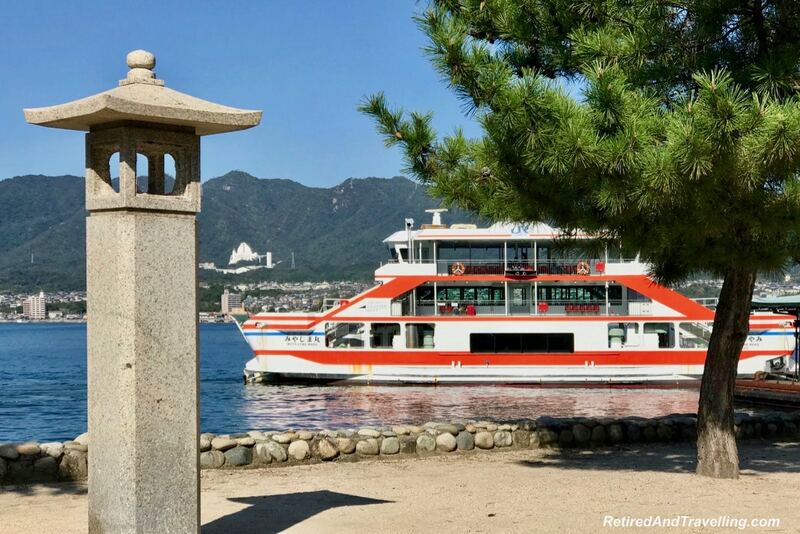 Make sure to take a ferry and visit Miyajima Island when in Hiroshima. Once we left the ferry dock, we started our walk to get to the O-torii Gate and the Itsukushima Shrine. We soon came across the free roaming deer. Any hint of food had the deer heading right for you. They would even eat your paper maps. We stopped along the way. And saw the ferry head back out for another run. We were rushed along to the next spot. 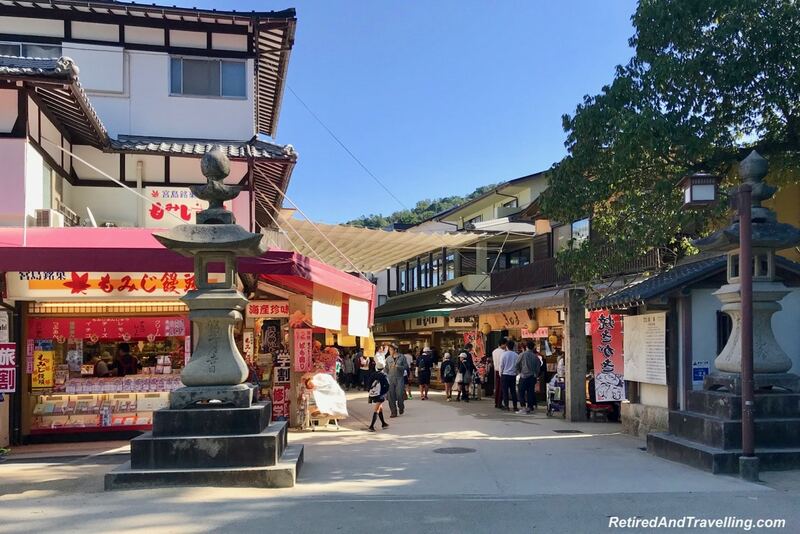 But plan enough time when you visit Miyajima Island when in Hiroshima. There is lots to see along the way. 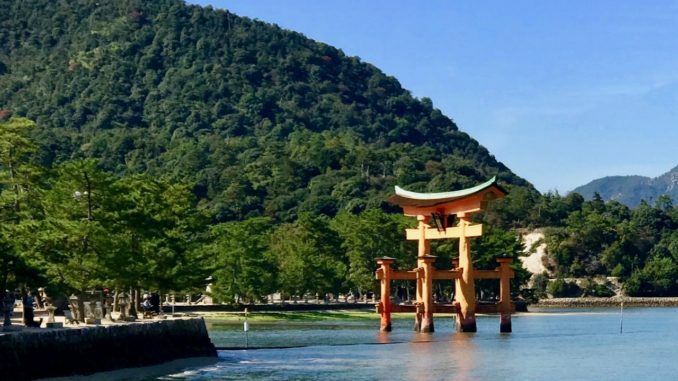 The O-torii Gate is the gateway to the Itsukushima Shrine. It was built in 1875, The main pillars are large (9.9 metres in circumference) and made of natural camphor trees. The four supporting pillars are made of natural cedar. The whole thing weighs about 60 tons and stands under its own weight. The roof is thatched with Japanese cypress. The vermillion colour of the gate and the shrine is said to keep evil spirits away. 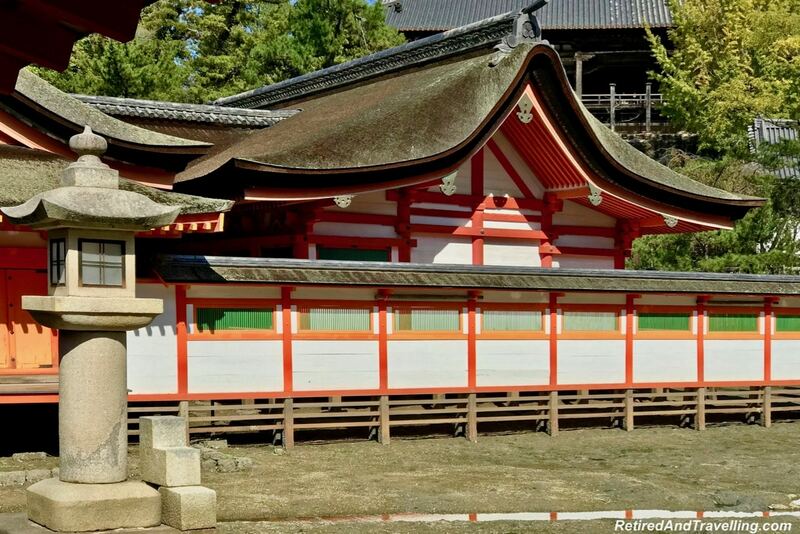 The buildings in the entire shrine complex are all coated with vermillion lacquer for protection. 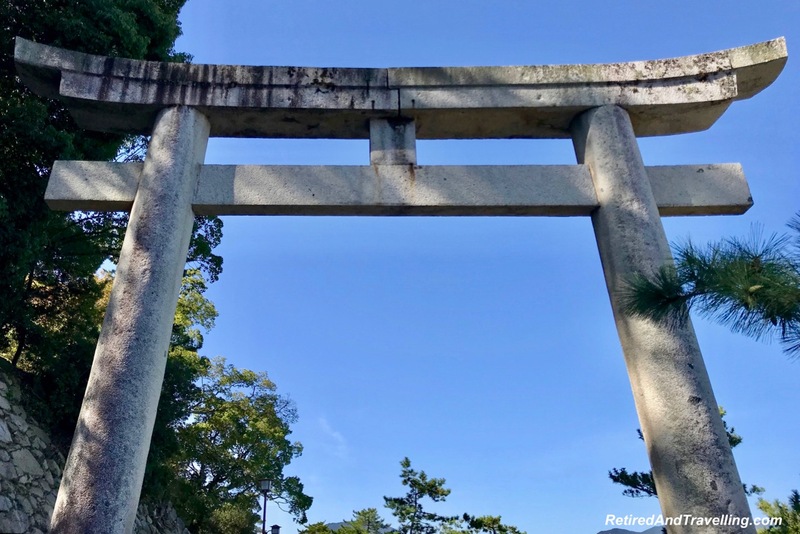 We got our first clear view of the O-torii Gate. It was definintely a stunning sight as it was reflected in the water. We were lucky to find a colourful kayak in the water. As we walked along, we caught a number of colourful images of the O-torii Gate. People were dressed in there Sunday best to pose with the gate and the deer. Others rode in rickshaws and posed along the route. Once we reached the Itsukushima Shrine, we caught the O-torii Gate in the background. We were delighted with our views of the O-torii Gate. 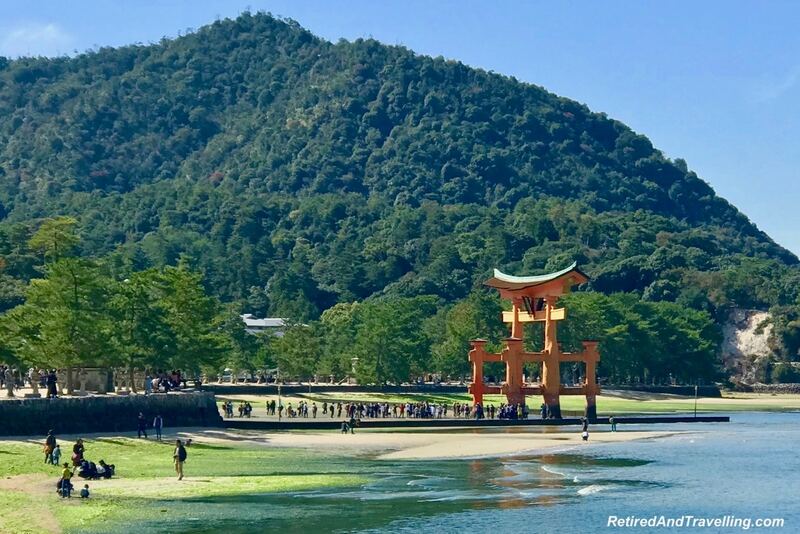 This is definitely one of the highlights when you visit Miyajima Island when in Hiroshima. 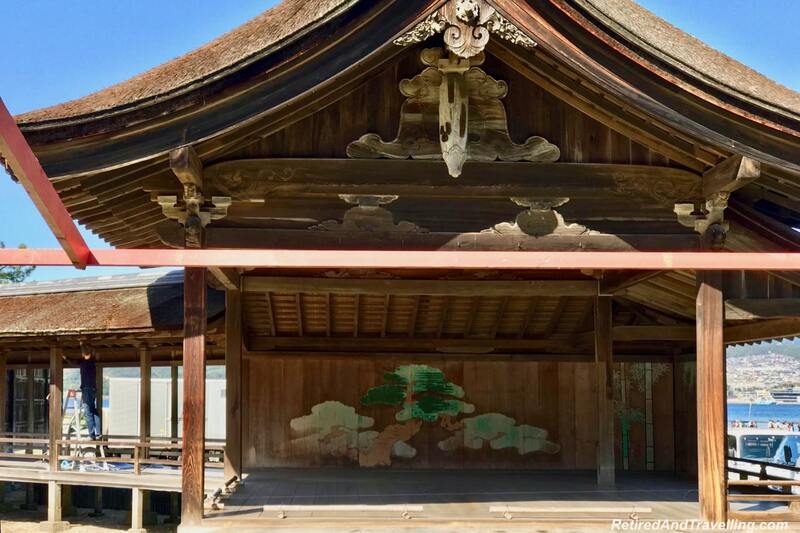 The Itsukushima Shrine was initially built in 593. And then was rebuilt again in the scale it is today in 1168. It was designated as a UNESCO site in 1996. 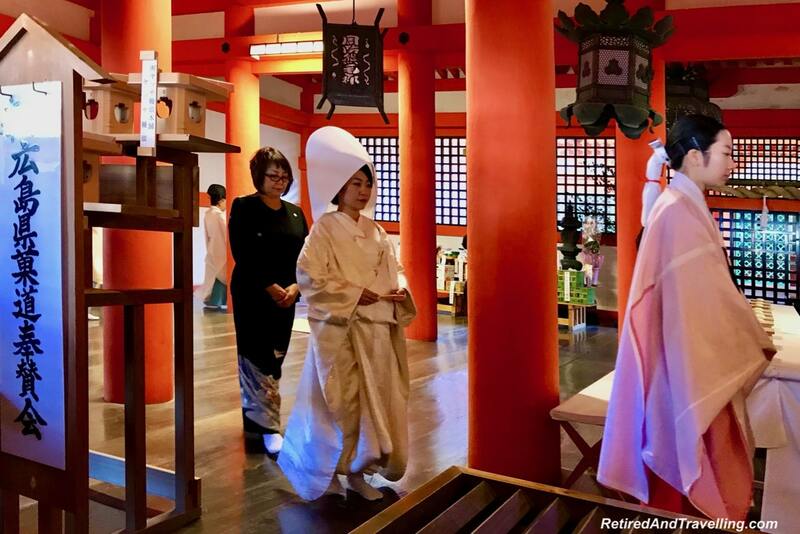 The shrine is dedicated to the three Munakata goddesses. They are the deities of the sea, traffic safety, fortune and accomplishment. It was built in the Shinden style of architecture. We walked in through the stone gate. It was guarded by a pair of lions. It reminded us of the lions we saw when we toured China and walked through Yu Gardens in Shanghai. Ahead of us was a twisty series of buildings and walkways. By now I had started to see familiar repeating shrine elements from our many visits on this trip to Japan. At the door was the water purification station. 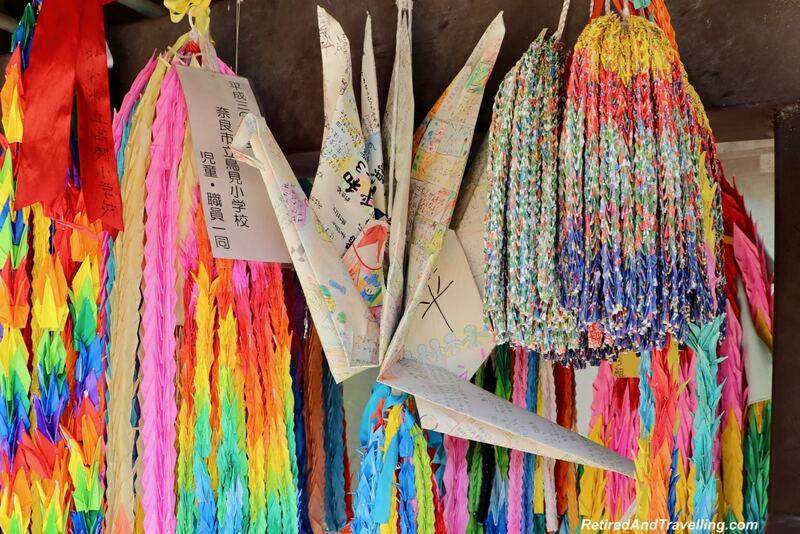 There were places where paper wishes were hung to be blessed. A spot was set aside for people to pray for their wishes. We saw plaques for donors to the shrine. An old arched bridge was closed off. 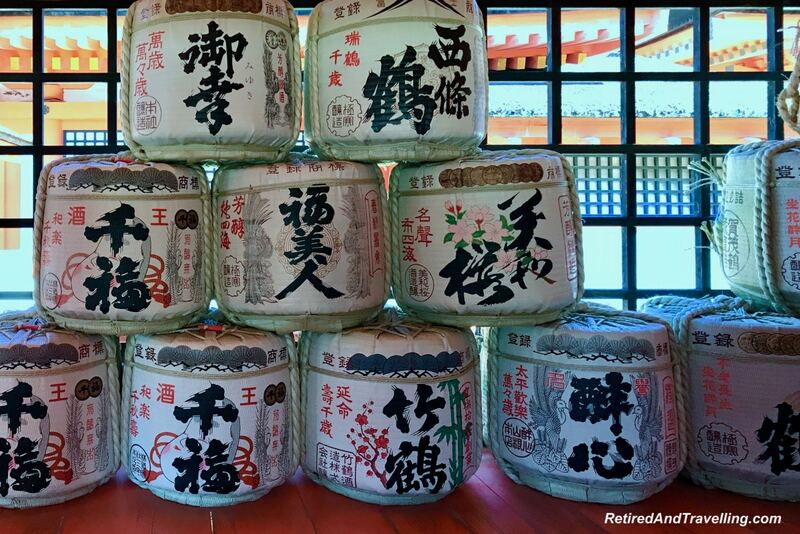 Empty barrels showed the sake that had been used for worship. 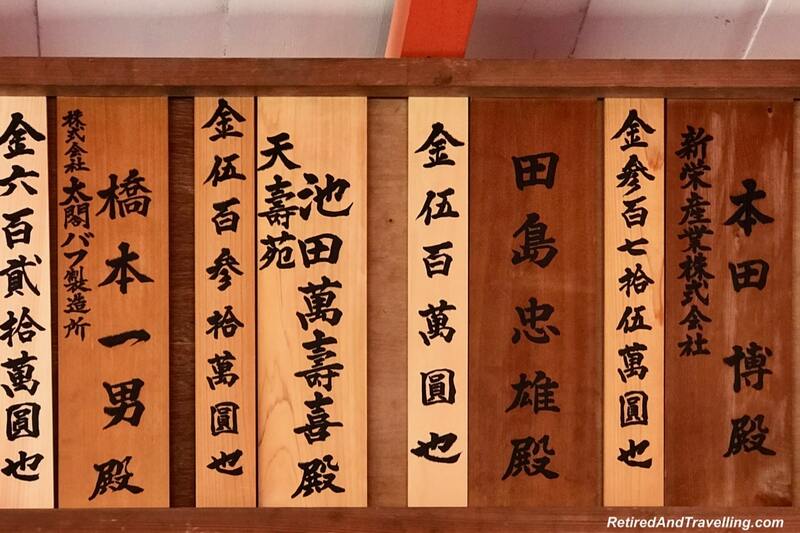 As we walked through the Itsukushima Shrine, many elements felt very familiar. It reminded me of the Fujisan Hongu Sengen Shrine under Mt Fuji. 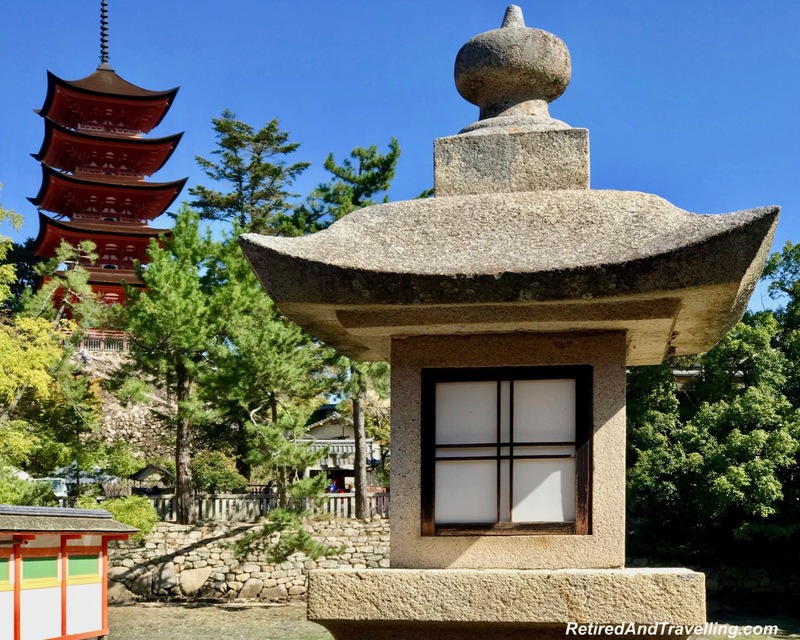 If you have visited other Shinto temples in Japan, you should plan to visit Miyajima Island when in Hiroshima. 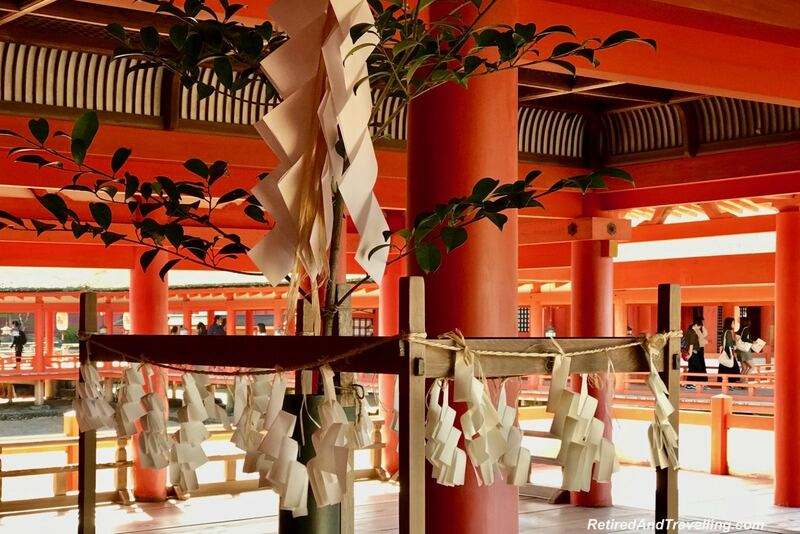 We were delighted to find that a wedding was in progress at the Itsukushima Shrine. 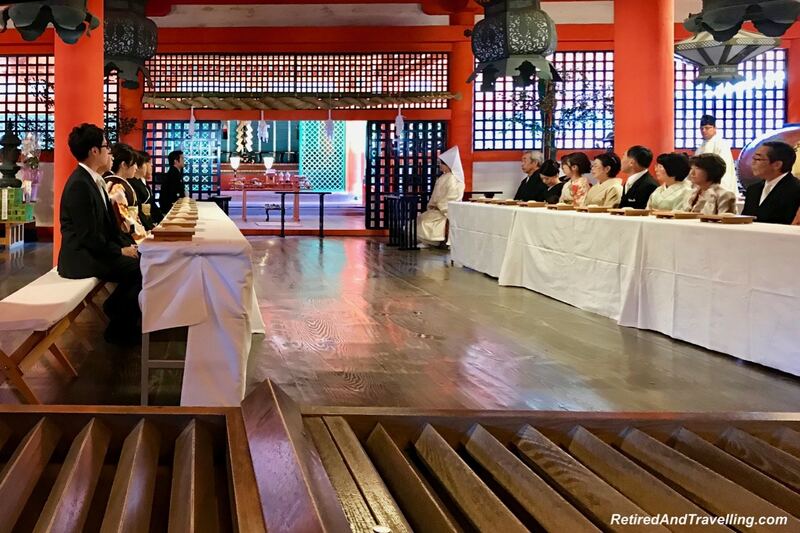 Just as we entered the main shrine, the wedding ceremony started. The guests were all arrayed at two tables. The bride walked in and then sat is a special place of honour. Gongs were rung while we watched. It was quite interesting to be part of this ceremony. When we walked along the corridors, we saw a five storied pagoda that stood over the Itsukushima Shrine. 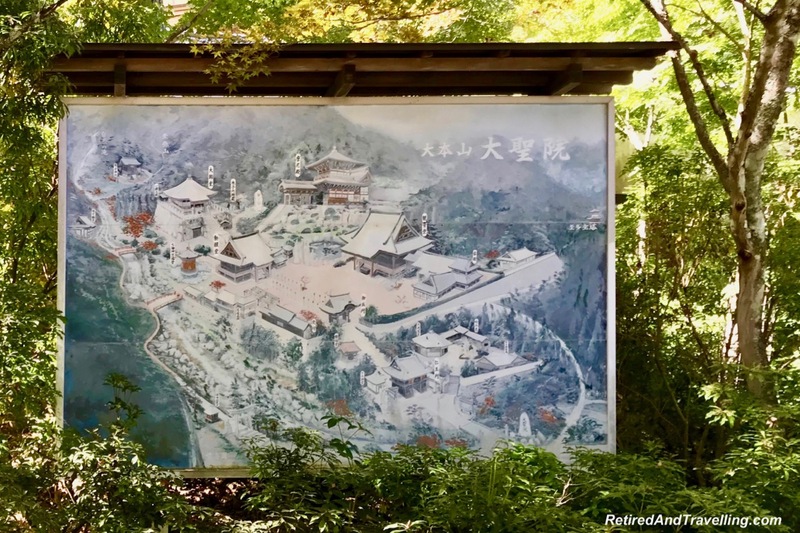 It combined Japanese and Chinese architectural styles. We did not get to visit the pagoda. But if we did, we would have found an image of Buddha painted in full colour on an inside wall. We stopped to look out at the theatre. A big show was coming up for the full moon. We were all very sorry we would miss that. 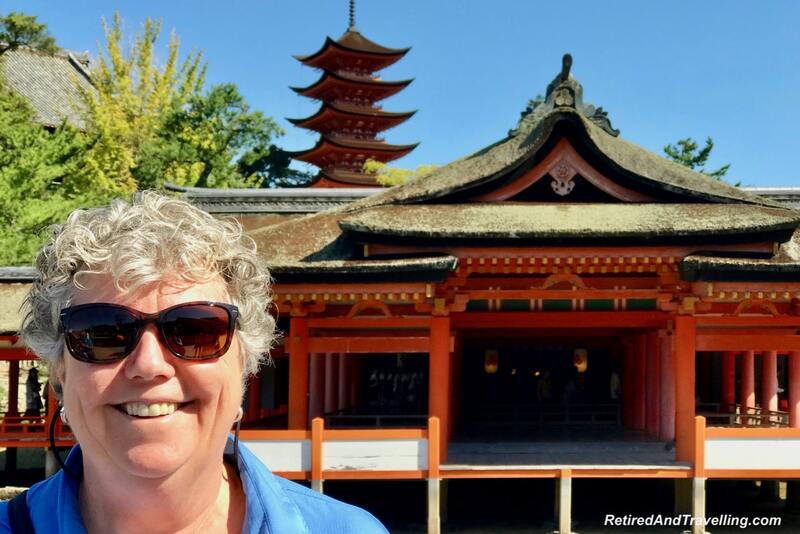 When we finished our visit to the Itsukushima Shrine, our guide gave us two options. People could take the remaining 40 minutes to stroll slowly back to the pier and shop along the way. 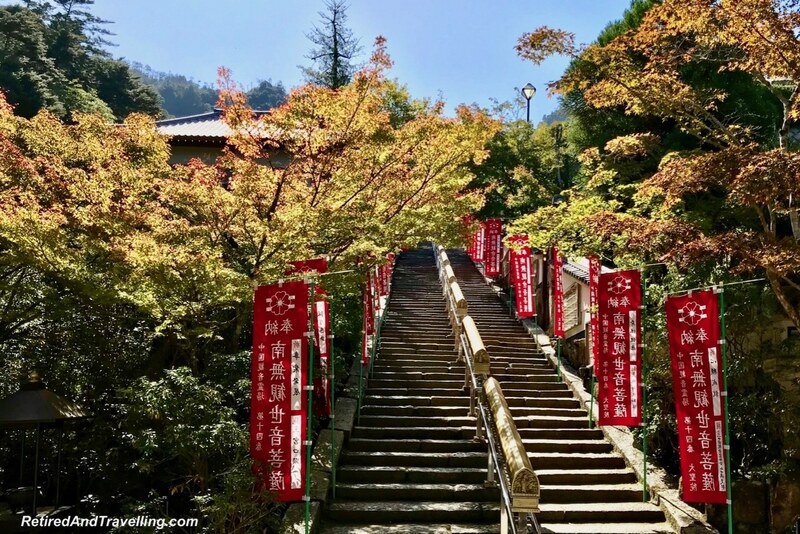 Or we could follow the guide up the hill to see the Daishoin Temple. 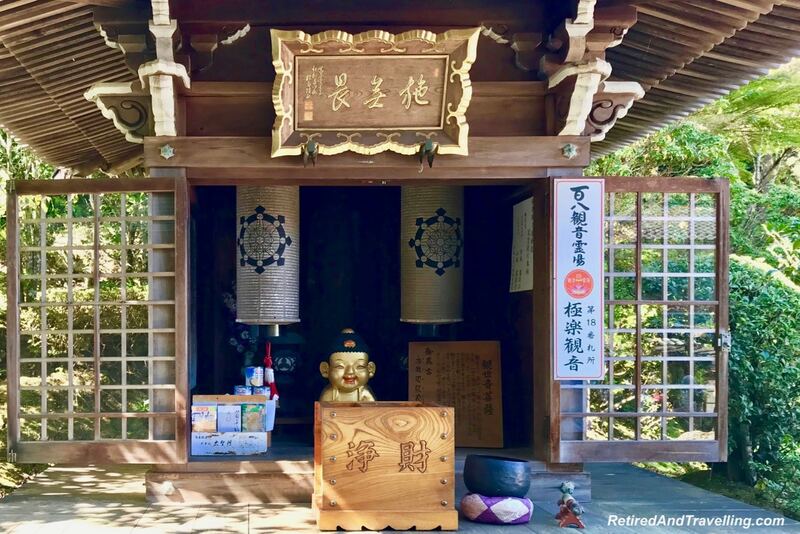 The Daishoin Temple is one of the most prestigious Shingon Buddhist temples in this part of Japan. I went with the people who followed the guide. 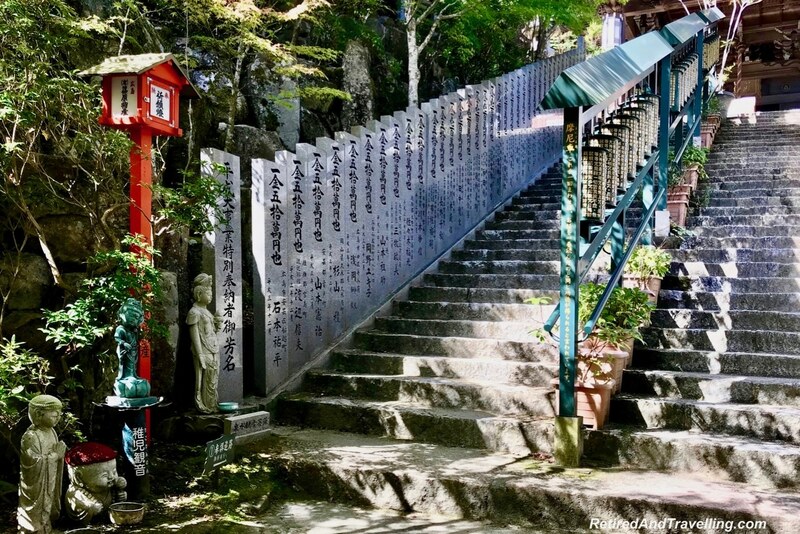 We walked up Mt Misen located in the centre of Miyajima Island. For the first part, we walked through small residential streets. When we reached the Daishoin Temple we went in through the Niomon Gate. A pair of statues stood guard on either side. In all of the other temples we visited, these statues were hidden behind mesh. 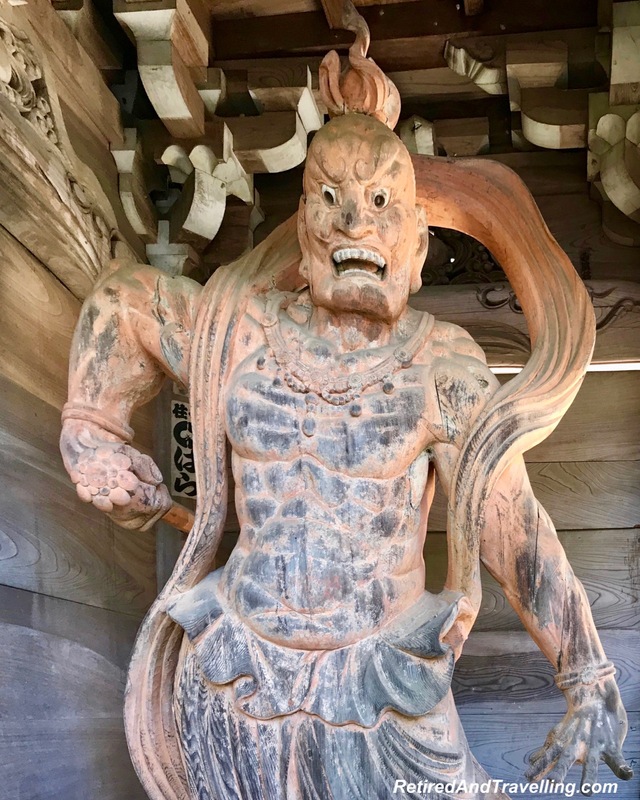 At the Daishoin Temple, I got my first good look at the statues. Right in front of us was the steep stairway to go further up. Along the stairway we saw the 600 volumes of scripture that were written on the columns. And then there were more stairs to get to the top. 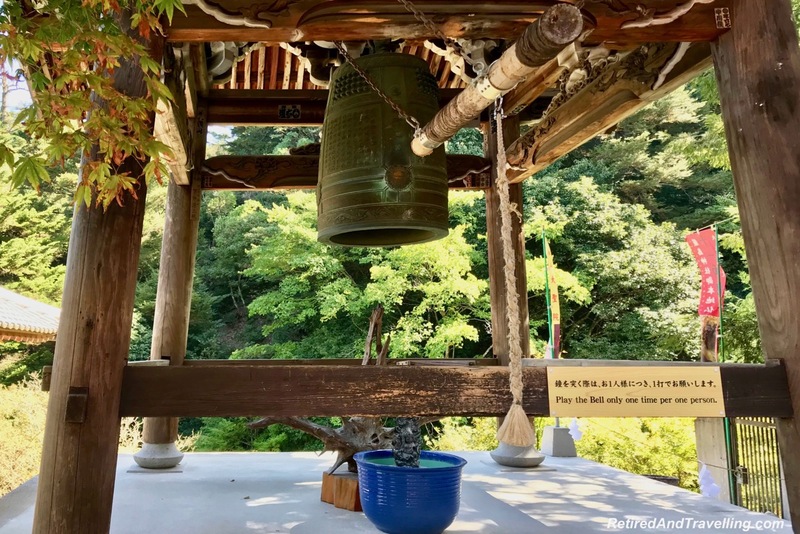 It was immediately obvious that our choice to visit the Daishoin Temple was the right one. 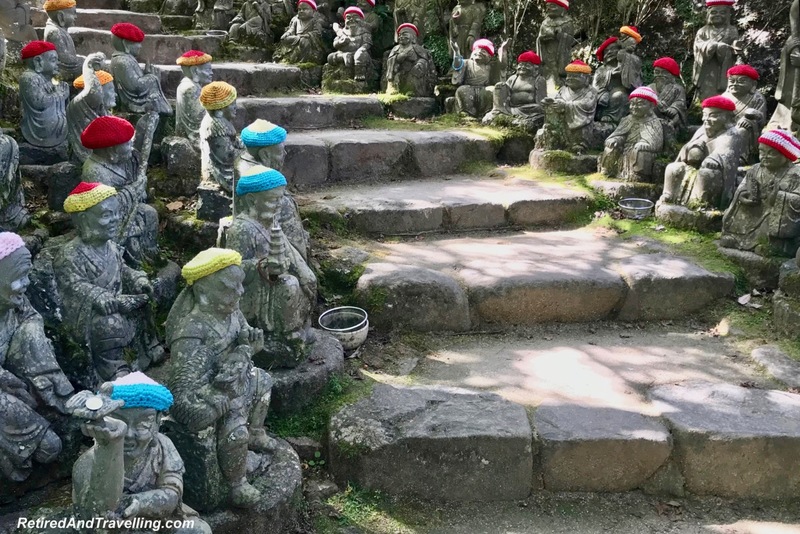 As we kept walking up, I was interested to see yet more small statues wearing knitted caps. 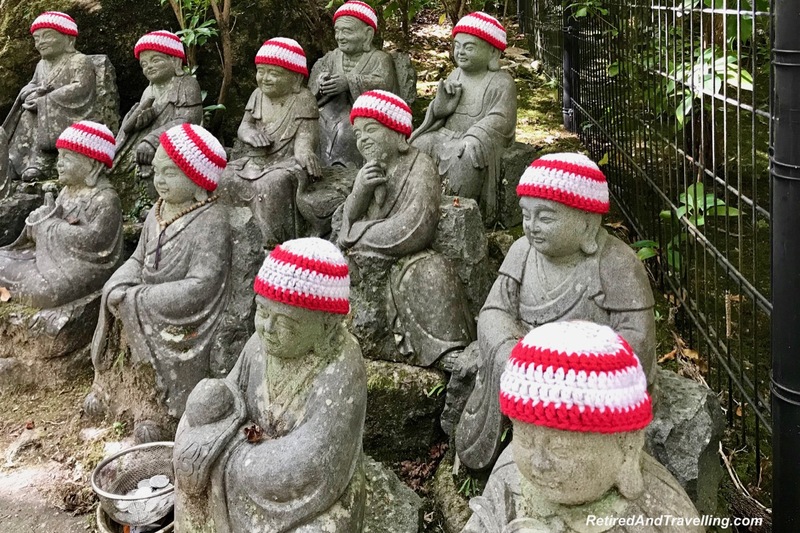 We first saw these Jizo Bosatsu when we visited the Zojoji Temple in Tokyo. There were 500 statues of the disciples of this temple. Each had a unique facial description. Different statues sat in with the small statues. At the belfry, we got the chance to actually ring the bell. At several other spots there were bells with long cords hanging down that we used to announce our arrival. We stopped at this point as we needed to return to port. 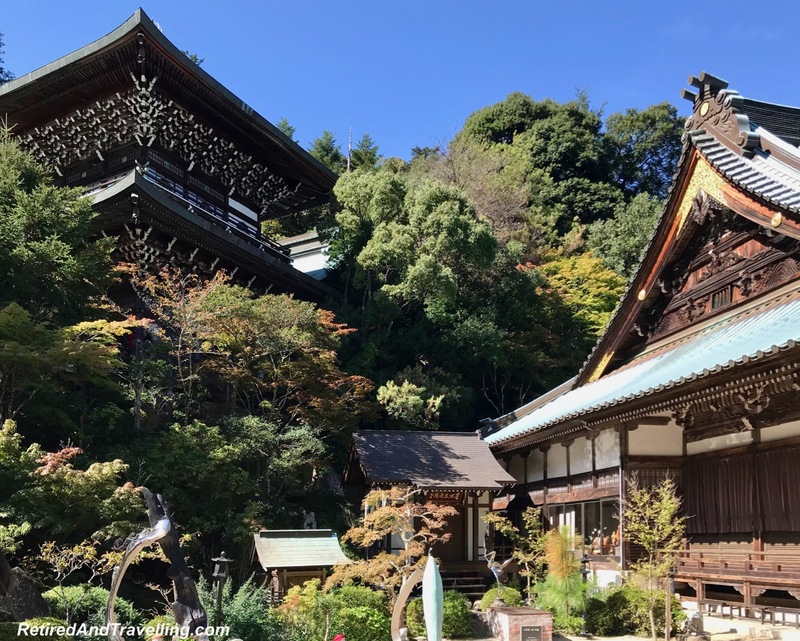 Up above we saw Maniden Hall and the Daishi-do Hall. Statues sat in front of the buildings. The leaves were just starting to turn and provided colour in the background. As we walked back down, I caught a golden image of a Buddha lying down. 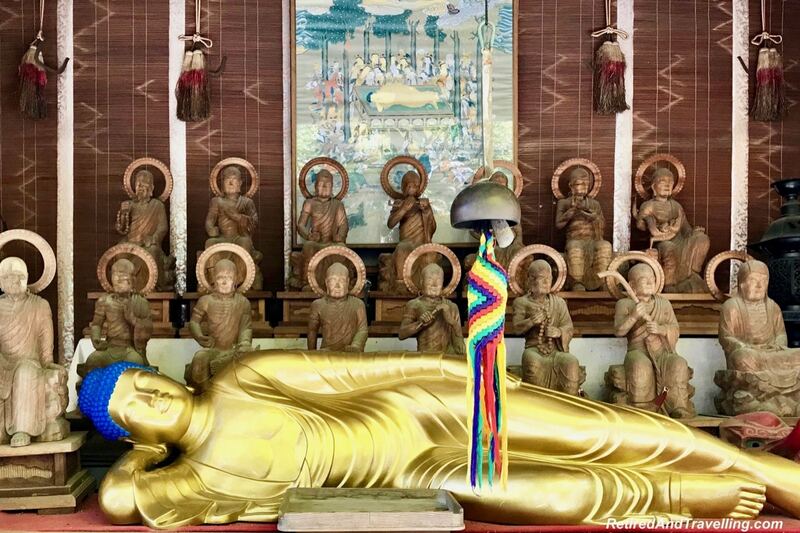 This is the statue of Shaka Nyorai or Shaka Buddha entering Nirvana with his 16 disciples. This reminded me a lot of the reclining Buddhas we saw when we visited the Dazu Rock Carvings in China. We passed quickly past the other worship areas. 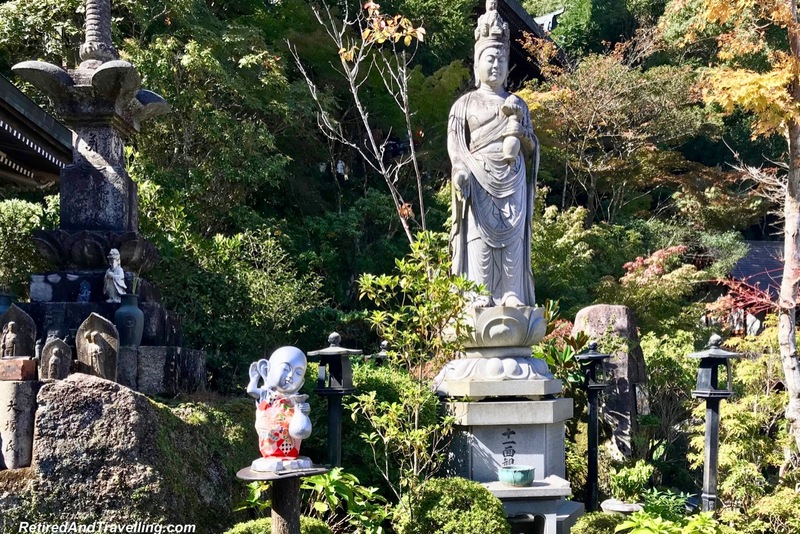 There was so much more to see at the Daishoin Temple. But we just ran out of time. 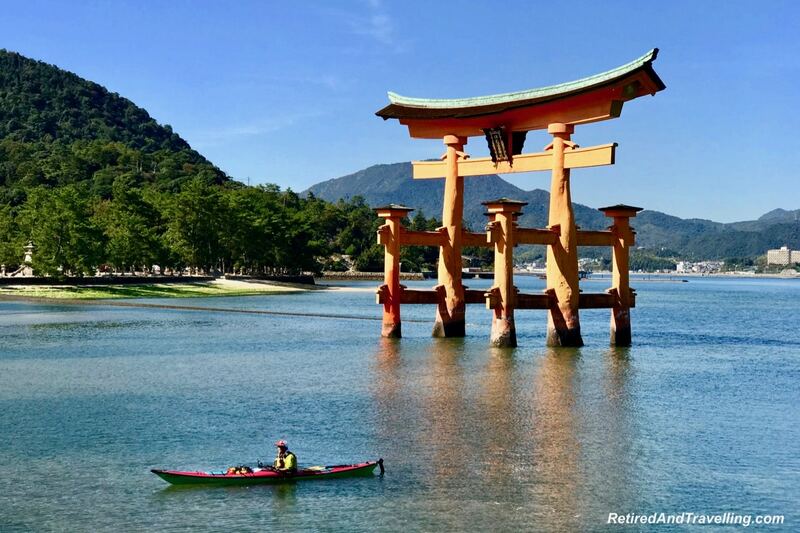 If you visit Miyajima Island when in Hiroshima, plan for more than 2 hours on the island. We ran a much faster pace back down the hill and to the port. We caught our last view of the O-torii Gate. Unfortunately, the tide was going out when we arrived. By the time we left, people could walk out on the sand to the gate. Our guide knew the fast way to get through the small town streets. Many people looked longingly at the stuff for sale. I just wanted to slow down long enough to pick up some fresh seafood. I was glad I chose Daishoin Temple instead of time in town. 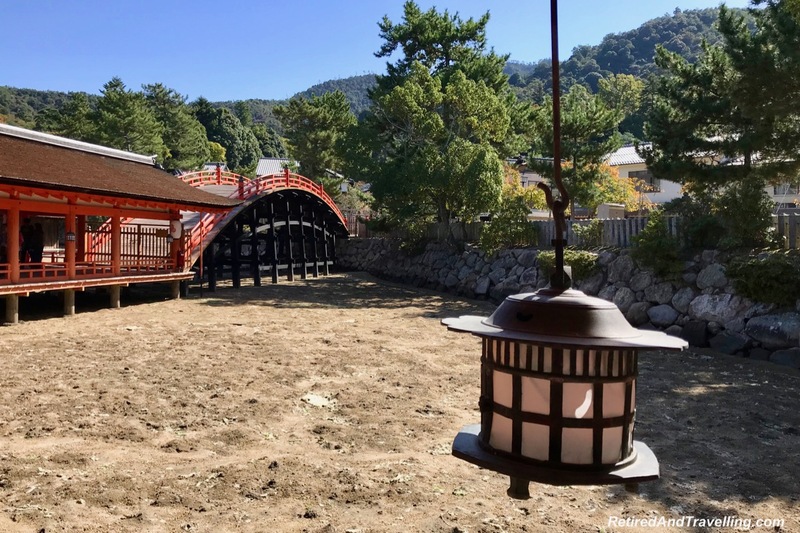 But if you visit Miyajima Island when in Hiroshima, you should plan enough time to do it all. On our trip back to the cruise shop, our guide had the bus driver do a detour so that we could drive past the Hiroshima memorial and museum. This city is instantly recognized for the devastation that rained down on it during WWII. In a quiet voice she talked a little about the history of the bombing of Hiroshima. And how this was being kept alive. 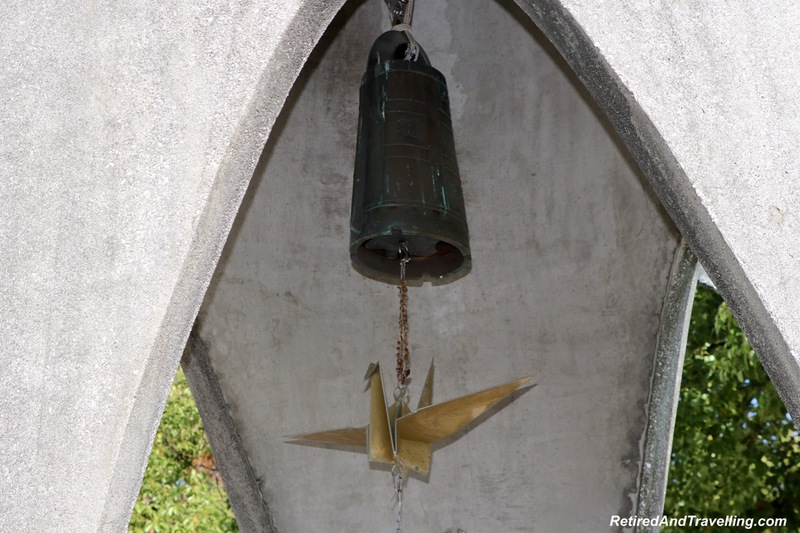 David had lots to share from his visit to the Hiroshima memorial. 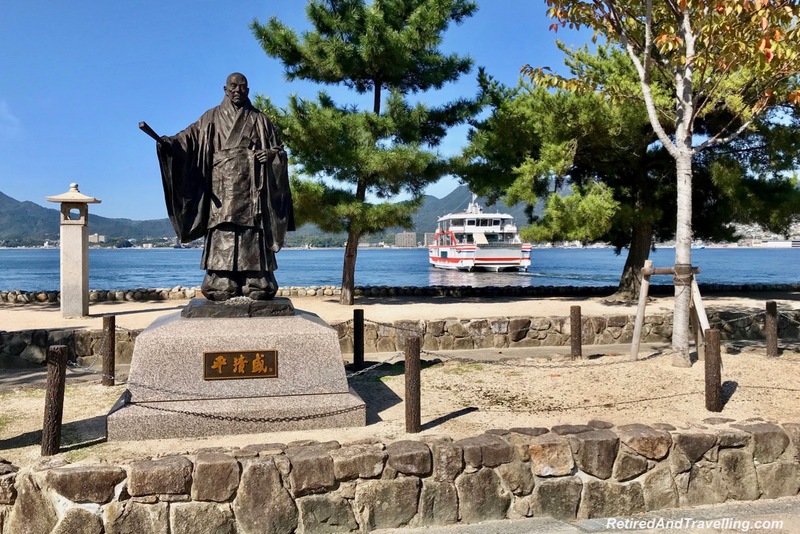 I was so glad I planned to visit Miyajima Island when in Hiroshima. It was a magical island filled with delightful views. And another older view of history. The streets were filled with local crafts and food. But I was glad that I passed on shopping so that I could visit the Daishoin Temple in addition to the Itsukushima Shrine. Two hours was just not enough time to really see this stunning island. It was certainly such a stark contrast to the horrors of the past in this city. When the bus parked at the cruise ship, we were greeted with a small gift of an origami crane. This is the symbol of peace. Certainly something that was forefront in my mind after our visit to Hiroshima. 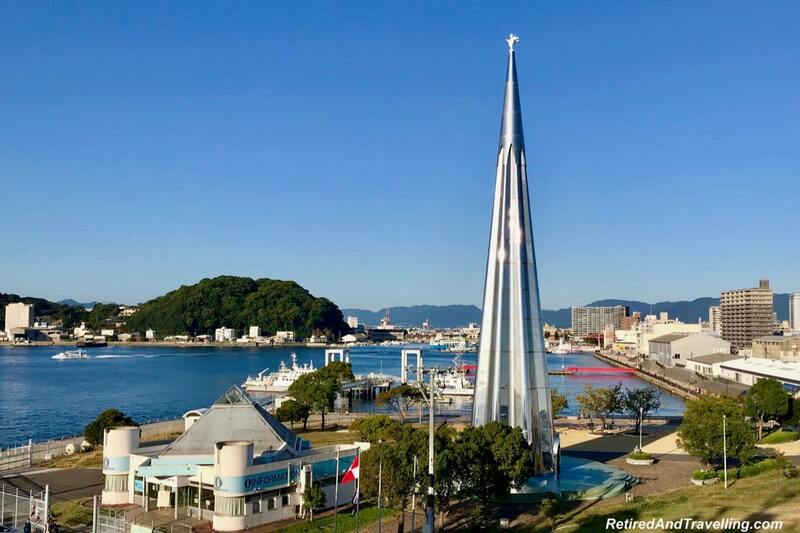 You may think that you don’t want to visit the city of Hiroshima. 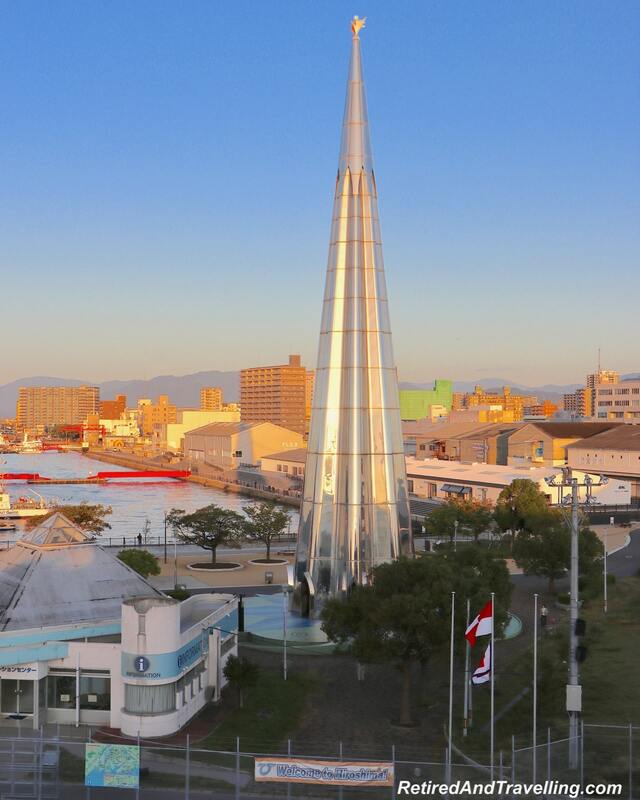 But we would strongly recommend that if you visit Japan, you add a stop to see the beauty and history in Hiroshima. 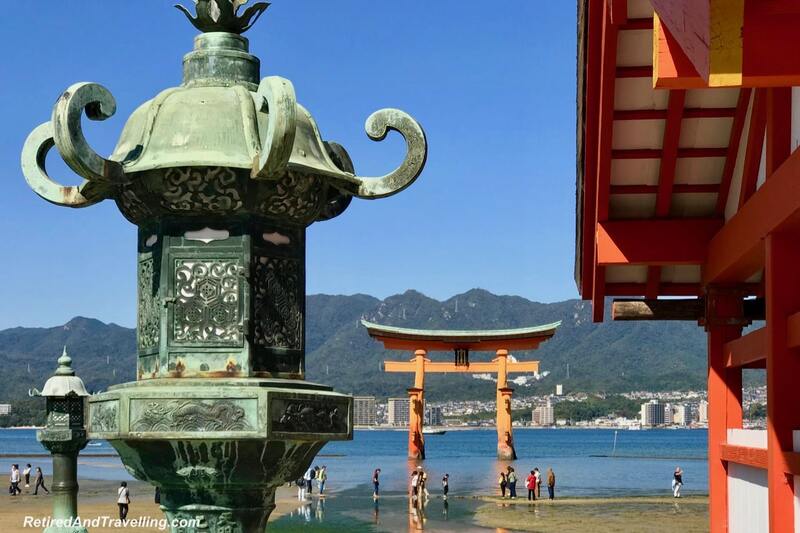 Did you visit Miyajima Island when in Hiroshima? What was your favourite thing to see? Definitely a must to visit Hiroshima, and for all of us to remember history and the effects of nuclear war. Glad these beautiful temples and gate on Miyajima have survived, and that you chose to go up to the second temple so I could follow along! I’m amazed at how much you got to see in 2 hours! 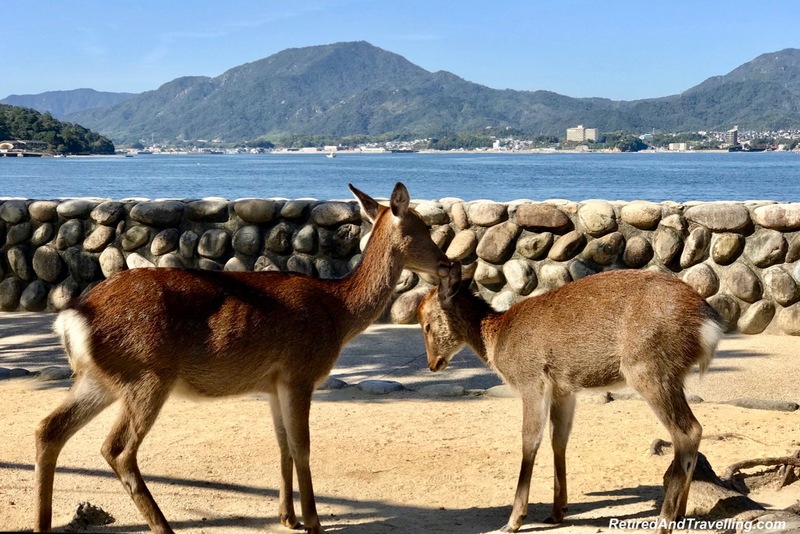 Miyajima Island look lovely with the Shrine, O-torii Gate and those adorable deer. I think you definitely made the right choice on your port visit. 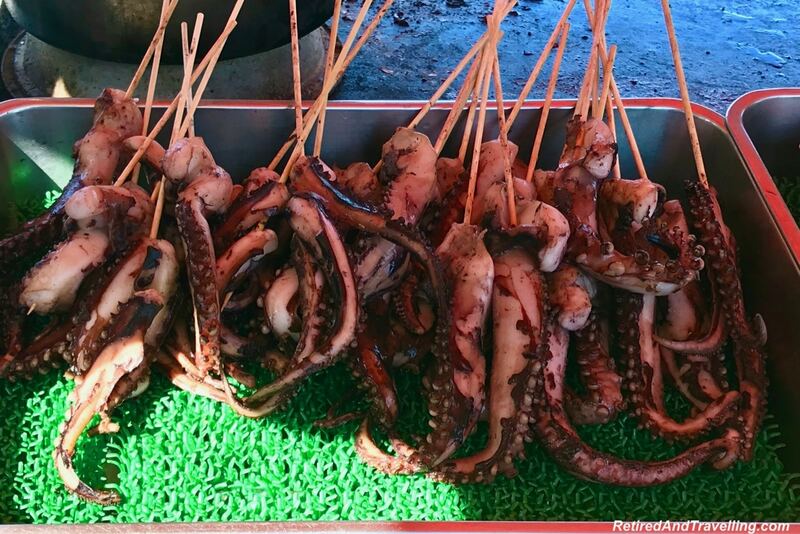 What an interesting part of Japan to visit. We’re planning a trip to Japan in winter, do you think a full day in Miyajima Island is enough? This is a very peaceful town in Japan!! Really love the historical significance! I’ve only seen this shrine in various movies, it’s been there forever!! 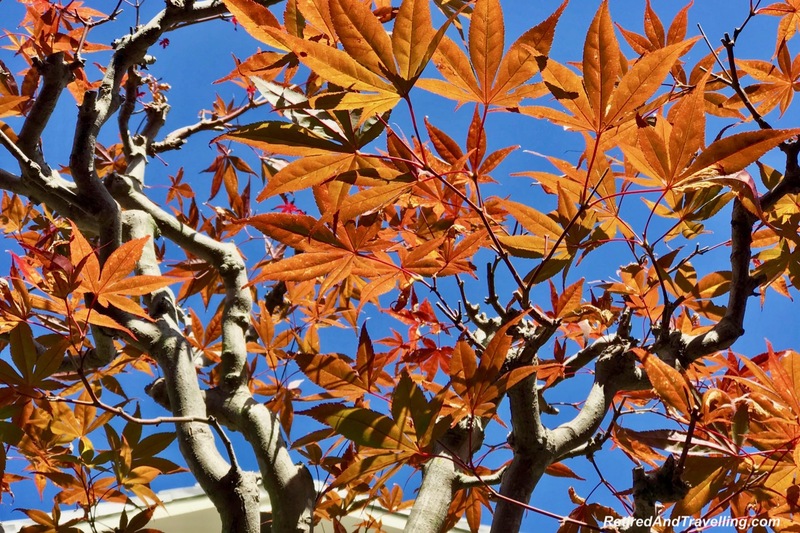 Such a symbol of strength for Japan! I’d love to visit Miyajima Island but won’t make it that far south when I’m in Japan next fall. 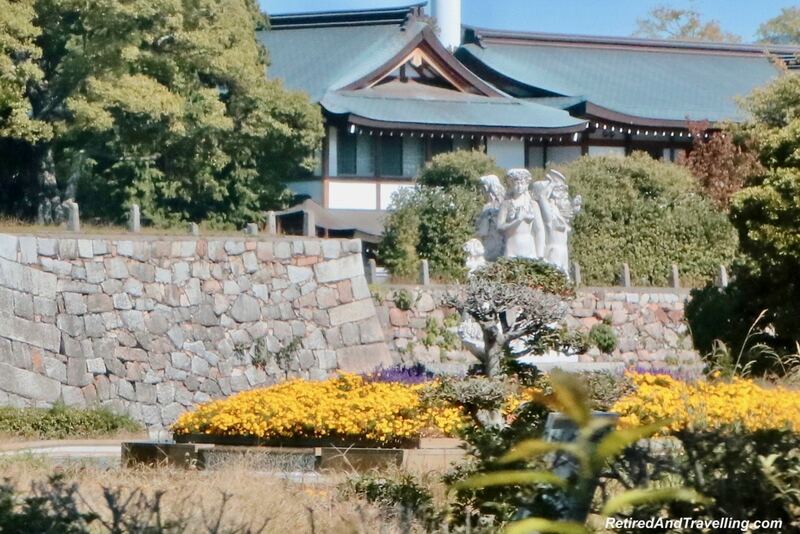 The deer and shrines are gorgeous and I’m with you on going to see the gate instead of staying in town. Funny about walking out at low tide. 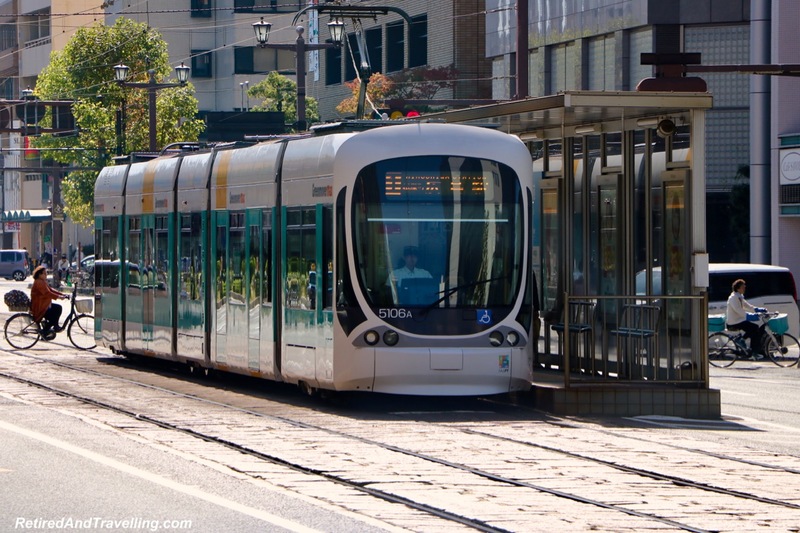 I love the streetcar back story. Running again 3-days after the bomb dropped is impressive. I hear that living through an event like that bonds and defines a city, much like London during the bombardment. 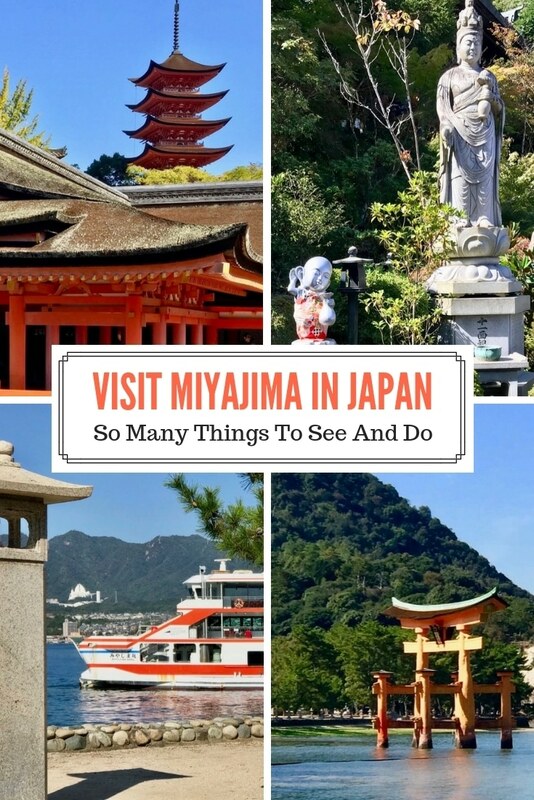 It does seem like you could have spent a lot longer on Miyajima Island and in Hiroshima. Sometimes cruise ship tours just give you a taste of places you really want to dive in to. It looks like such an interesting place to explore. 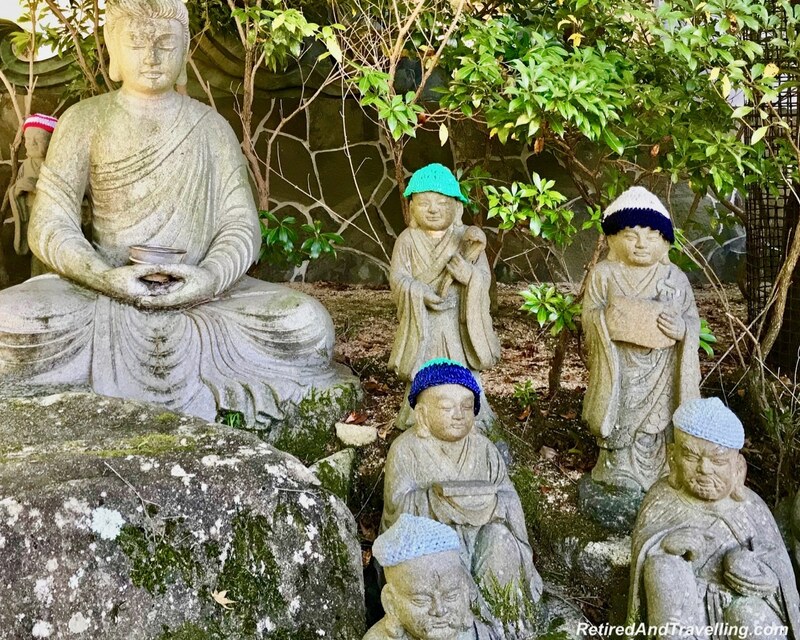 Did you find out why the statues all wore knit caps. That seems so odd to me. 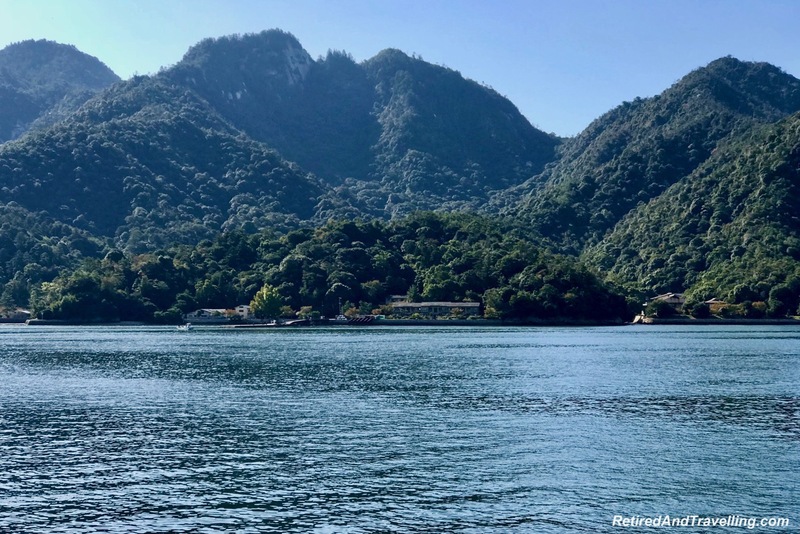 Miyajima Island looks like a paradise. I have been wanting to see the O-torii Gate for a longtime and love that no industry is allowed on the island. I can’t believe how tame the deer are, what a great day! Japan is one of my countries in the whole world. 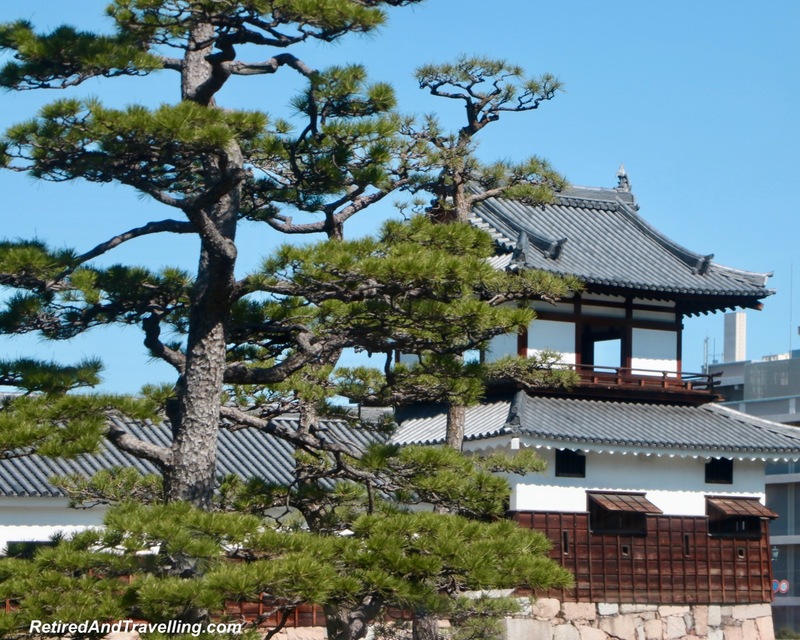 And, both the beautiful temples and gate on Miyajima are a must visit. So much history and beauty to experience. I’ve been to Japan almost ten times now, but never to Miyajima. Good to know it’s easily accesible via ferry, but you’re right, how can 2 hours be enough! 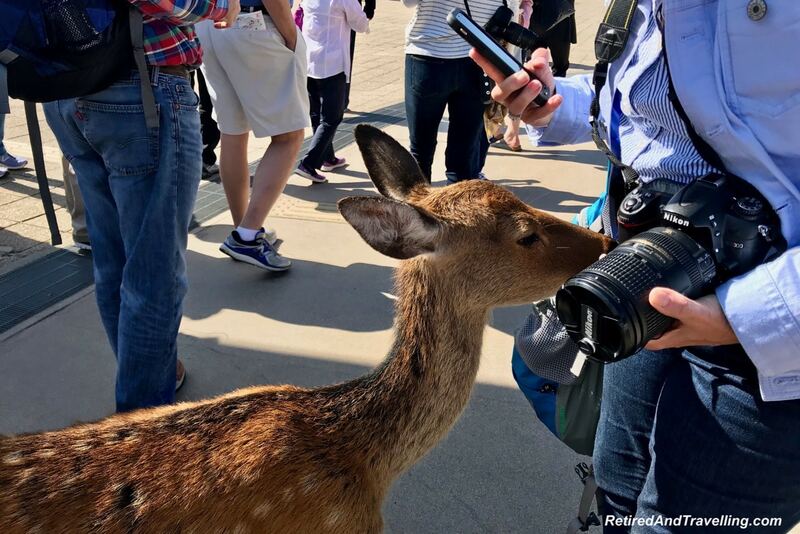 The deer at Itsukushima Shrine kinda reminds me of Nara. And how lucky you are to have witnessed a traidtional wedding ceremony!